WS and i invited some friends around for a Malaysian-themed dinner on Sunday, spending most of the afternoon in the kitchen preparing our dishes. it was good fun, both the cooking and the hosting. food-wise, we went for a Malaysian-Chinese theme because we thought that it would be a new experience for our american/ german/cypriot friends and would touch upon WS’s cultural roots. Nyonya comes from Baba-Nyonya, which refers to Chinese immigrants who settled in Malaysia and Indonesia in the 15th and 16th centuries. (Also known as Peranakan Chinese people.) These ethnically Chinese settlers generally assimilated into the local communities, adopting Malay customs and speaking Malay – often at the expense of their own Chinese language abilities! ‘Baba’ and ‘Nyonya’ are loan words from other languages; Baba referring to these Peranakan gentleman, and Nyonya, to the ladies. 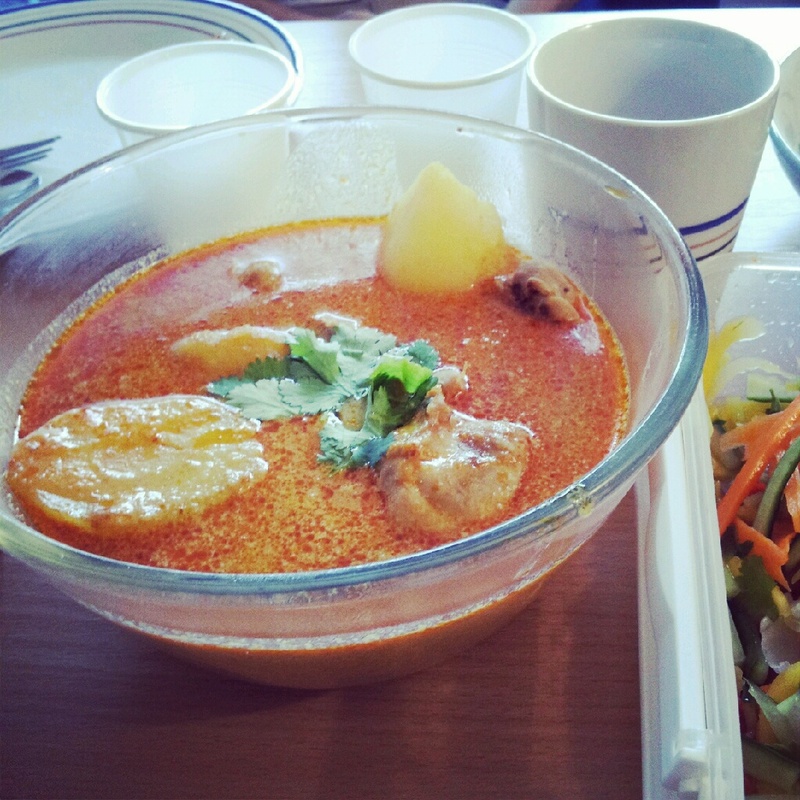 Nyonya curry is different to Malay and Chinese curries in the way that it is a little more diluted (hence less creamy), and that it makes use of ingredients like lime juice for sourness that lends an extra dimension to the heat of the chilli and ginger. I can’t really eat very spicy foods despite wanting to be able to stomach it (!) so I loved this curry, made with the help of the Ayam brand Nyonya curry paste and coconut milk. i have helped to make curry paste from scratch and wouldn’t be able to do so without a proper food blender! Now this, this, is a new favourite of mine. Mango Kerabu, aka The Best Mango Salad You’ll Ever Have. Sadly I only got a shot of this before we mixed it all together with the dressing, but ok, I’m going to make it soon so I’ll update this post at a later date. 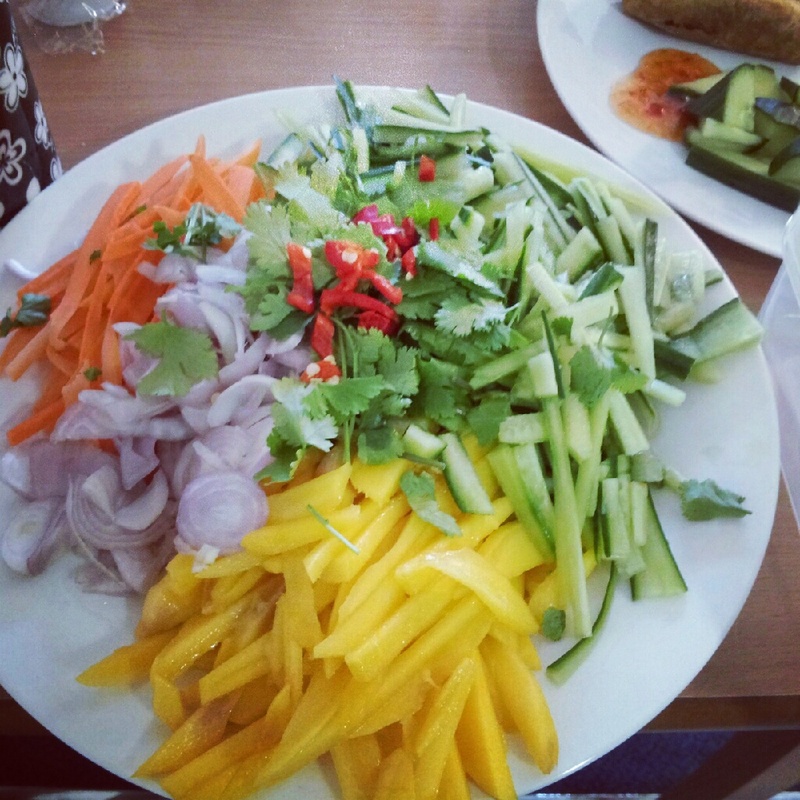 Mango Kerabu is very similar to Thai Papaya Salad, which makes use of green papaya. So instead of papaya, you use unripe mango. (There weren’t any purely green mangoes at the supermarkets so I went for the firmest one I could find.) This is a fantastically cooling salad comprising of shredded carrot, cucumber, mango, shallots and coriander dressed with a mixture of lime juice, fish sauce, sugar, a little bit of fresh red chilli (chilli padi), and a dash of white pepper. Portions are easy: 1 of everything! (1 medium sized carrot, 1 cucumber – you can omit the watery seed core though, 1 mango, 1 +1 shallots – oops i lied, and 1 bunch of coriander leaves!) as for the dressing, i would experiment with the ratios and volumes but i suggest lime juice: fish sauce is in a 1:1 ratio, and the rest is to your personal taste. If you prefer the dressing to be more tart, then up the lime juice though I suggest you also add a little more sugar just so that the sour is balanced with the sweet. all right this entry doesn’t do Mango Kerabu justice so i’m going to write up a post on it another time, with a better picture of the salad mixed! 🙂 in the mean time, has anyone else ever made Mango Kerabu before? what kinds of proportions did you use for the dressing?